For steam, energy is primarily contained in the latent heat and, to a lesser extent, the sensible heat of the fluid. The latent heat energy is released as the steam condenses to water. Additional sensible heat energy may be released if the condensate is further lowered in temperature. In steam metering, the energy content of the steam is a function of the steam mass, temperature and pressure. Even after the steam releases its latent energy, the hot condensate still retains considerable heat energy, which may or may not be recovered (and used) in a constructive manner. The energy manager should become familiar with the entire steam cycle, including both the steam supply and the condensate return. When compared to other liquid flow metering, the metering of steam flow presents one of the most challenging metering scenarios. Most steam meters measure a velocity or volumetric flow of the steam and, unless this is done carefully, the physical properties of steam will impair the ability to measure and define a mass flow rate accurately. The temperatures associated with steam flow measurement are often quite high. These temperatures can affect the accuracy and longevity of metering electronics. Some metering technologies use close-tolerance moving parts that can be affected by moisture or impurities in the steam. Improperly designed or installed components can result in steam system leakage and impact plant safety. The erosive nature of poor-quality steam can damage steam flow sensing elements and lead to inaccuracies and/or device failure. The challenges of metering steam can be simplified measuring the condensed steam, or condensate. The metering of condensate (i.e., high-temperature hot water) is an accepted practice, often less expensive and more reliable than steam metering. Depending on the application, inherent inaccuracies in condensate metering stem from unaccounted for system steam losses. These losses are often difficult to find and quantify and thus affect condensate measurement accuracy. Volumetric metering approaches used in steam metering can be broken down into two operating designs: (1) differential pressure and (2) velocity metering technologies. For steam three differential pressure meters are highlighted: orifice flow meter, annubar flow meter, and spring-loaded variable area flow meter. All differential pressure meters rely on the velocity-pressure relationship of flowing fluids for operation. Differential Pressure – Orifice Flow Meter. Historically, the orifice flow meter is one of the most commonly used meters to measure steam flow. 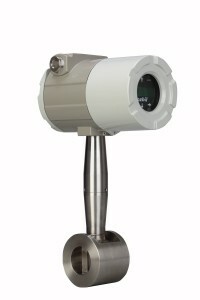 The orifice flow meter for steam functions identically to that for natural gas flow (see previous section). For steam metering, orifice flow meters are commonly used to monitor boiler steam production, amounts of steam delivered to a process or tenant, or in mass balance activities for efficiency calculation or trending. Differential Pressure – Annubar Flow Meter. The annubar flow meter functions the same way for steam flow as it does for natural gas flow. Differential Pressure – Spring-Loaded Variable Area Flow Meter. The spring-loaded variable area flow meter is a variation of the rotameter. There are alternative configurations but in general, the flow acts against a spring-mounted float or plug. The float can be shaped to give a linear relationship between differential pressure and flow rate. Another variation of the spring-loaded variable area flow meter is the direct in-line variable area flow meter, which uses a strain gage sensor on the spring rather than using a differential pressure sensor. The two main type of velocity meters for steam flow, turbine and vortex shedding, both sense some flow characteristic directly proportional to the fluid’s velocity. Velocity – Turbine Flow Meter. The turbine flow meter functions the same way for steam flow as it does for natural gas flow. Velocity – Vortex-Shedding Flow Meter. The vortex-shedding flow meter functions the same way for steam flow as it does for natural gas flow.